Zen Shiatsu is a hands-on Japanese Zen Healing Art with origins in Traditional Chinese Medicine (TCM) and has been modernized and adapted over many years. Shiatsu is more than a massage technique. Shiatsu can improve the Ki (vital life-force also known as Chi) flowing through the meridians (channels of living magnetic energy) existing throughout the body. When we are healthy, Ki flows smoothly supporting all our energy systems such as respiratory, cardiovascular, digestive and nervous systems to name a few. When Ki becomes blocked or disturbed in any way, we manifest symptoms, become ill or feel "out of sorts". An experienced shiatsu practitioner is able to release these energetic blocks thus increasing vital energy and restoring balance. ​People come to shiatsu with all kinds of ailments, ranging from the physical to the emotional or mental. They enjoy shiatsu as it does not force outcomes and feels very supportive. The physical support felt during a shiatsu treatment allows us to "let go" of the mental and emotional aspects of what we are currently experiencing and relax deeply. 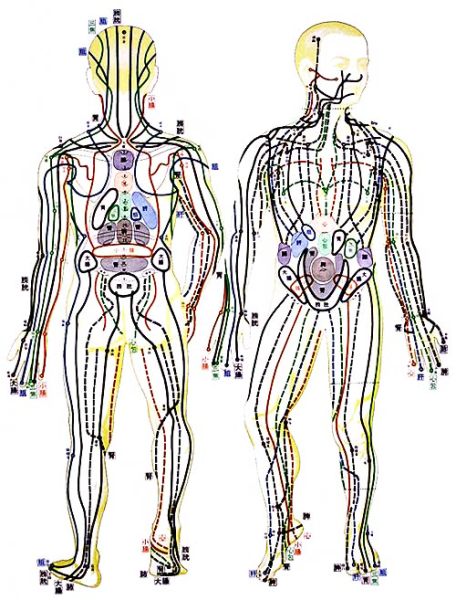 Meridians (energy channels) used in Zen Shiatsu. Receiving shiatsu can be a wonderful reprieve from the times when we feel overwhelmed by the sheer pace of life, leaving us feeling refreshed with a better perspective, and renewed resolve. Shiatsu is received fully clothed on a futon. Sessions last anywhere from 60-90 mins and are suitable for people of all ages. Eastern medical practice. A skilled shiatsu practitioner can utilise this knowledge to advise each recipient individually in the areas of diet and corrective exercise.